The weather has been chillier and damp the past few days, so this hearty, tasty, spiced beef stew has been a sufficient belly warmer. 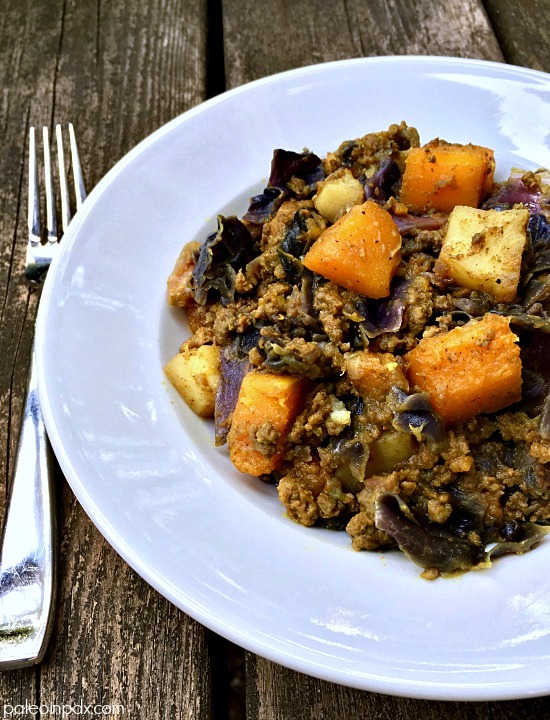 Full of butternut squash, white sweet potato, red cabbage, ground beef, and flavorful spices, it’s a winning combination. Also, this probably comes as no surprise, but the flavors are even more abundant the next day and the texture becomes a bit creamy too. The creaminess is a result of the squash breaking down more when reheated and stirred. The sweet potato holds together more since it’s starchier, but probably adds a dose of its own creaminess as well. Regardless, it’s legit. Meanwhile, catch me next Wednesday, October 18 on KATU Afternoon Live! I’ll be making my pumpkin spice chocolate clusters that I shared last week. Stay tuned! Melt ghee or other fat of choice in a large pot over medium heat. Add the onion and garlic, and sauté a couple minutes. Then, add the ground beef and cook until browned, about 5-7 minutes, breaking up the pieces with a spatula as needed. Next, add the cabbage and 1 tsp sea salt. Stir, cover, and cook over medium-low heat for 5-7 minutes. Add the butternut squash, sweet potato, broth, vinegar, turmeric, cumin, cinnamon, cayenne, remaining 1 tsp sea salt, and black pepper. Stir, cover, and cook for 10 minutes. Check sweet potatoes and squash with a fork and if need be, cover and cook for another 3-5 minutes. Taste and adjust sea salt, pepper, and spices as desired. I’ll have to give this one a try! I am so happy you enjoyed it, Sara and thank you for sharing! I’m glad you made it work for you and with what you had on hand too. Now, I might have to try it with acorn squash sometime!